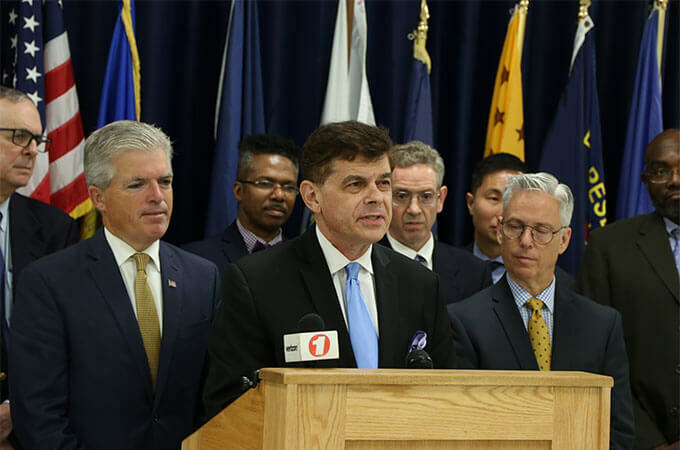 In connection with Prostate Cancer Awareness Month, we joined forced with Suffolk County Executive Steve Bellone to launch a prostate cancer prevention campaign. Suffolk County will conduct a public awareness campaign and will partner with local hospitals and health clinics to encourage the early detection, prevention and treatment of prostate cancer. One of the county’s most public efforts will be to flood the County Government Building in Hauppauge, NY, in blue light, in recognition of Prostate Cancer Awareness Month. Prostate cancer is the most common non-skin cancer diagnosed among men who live in the United States, with 164,690 men expected to be diagnosed in 2018. Prostate cancer is the second leading cause of cancer death in American men but awareness and early detection contributes significantly to the battle against this cancer. About one man in nine will be diagnosed with prostate cancer during his lifetime. About one in 41 men will die of prostate cancer. Although this is a serious disease, it is not a death sentence. Most men diagnosed with prostate cancer do not die from it. In fact, more than 2.9 million men in the United States who have been diagnosed with prostate cancer at some point are still alive today. Awareness and detection contributes significantly in the battle against this cancer. In addition to other local dignitaries and community leaders, the Suffolk County effort was supported by physicians from local leading hospitals. If you’re organizing local events or campaigns to raise awareness about prostate cancer testing and treatment options, or to deliver free PSA screenings, we would be delighted to partner with and support your efforts. We invite you to get in touch with us to tell us more about your plans.